RAINER (1977) The fishing vessel Rainer grounded and was lost December 4, 1977 approximately 12 miles off of Cape Cheerful in the Aleutian Islands near Dutch Harbor. RAYMOND A (1982) The 76 foot wooden crab fishing vessel Raymond A was consumed by fire January 29, 1982 north of Umnak Island in the Bering Sea. All six crewmembers were rescued by the fishing vessel Ocean Cape. REBECCA B (1996) The 77 foot longline halibut fishing vessel Rebecca B grounded on a shoal 50 feet from the beach and became a total loss October 24, 1996 at Cape Sasmik in the south shore of Tanaga Island. The crew had been fishing for 20 to 48 hours strait and was headed to a safe anchorage to escape oncoming weather. The skipper fell asleep at the helm and the Rebecca B ran up on the rocks at full speed. All seven crewmembers were rescued by a U S Navy salvage tug and taken to Adak. REINA (1965) The 94 ton 74 foot oil screw Reina foundered at Segum (probably Seguam) Island November 13, 1965. The vessel was last heard from in trouble in 100 mile an hour winds. Lost with the Reina were skipper Vic Hansen (41), John Allen (42), John McReynolds (21) and Jim Adams (24). The Reina had recently been brought north from Guayaquil, Ecuador. RO-61 (1942) The 250 foot Japanese submarine RO-61 was sunk by the Navy destroyer Reid September 1, 1942 five miles north of Cape Shaw on Atka Island. 60 crewmen were lost with the RO-61 and five survived. ROCKETT II (2002) The 44 foot halibut longline fishing vessel Rockett II lost power, drifted onto the rocks and broke up October 21, 2002 near Cape Cheerful approximately 10 nautical miles northwest of Dutch Harbor. All three crewmembers were rescued from the water by the 151 foot crab fishing vessel Stormy Sea and taken to Dutch Harbor. ROSIE G (1997) The 80 foot steel crab fishing vessel Rosie G took on water from the stern and sank January 30, 1997 approximately 17 miles northwest of Cape Cheerful on Unalaska Island. The vessel was on her way to the St. Paul Island area crab fishing grounds with 75 crab pots on board. Her stability letter only allowed 65 crab pots in non-icing conditions and 55 crab pots when the temperature was below 40 degrees. Winds at the time of the disaster were northwesterly with seas eight to ten feet. The temperature was 40 degrees. The Rosie G developed a 45 degree starboard aft list and began taking on more water than her pumps could keep up with forcing her crew to abandon ship. The six crewmembers donned survival suits, made it to a life raft and were picked up by the fishing vessel Handler. The Rosie G sank by the stern in 4,734 feet of water. The Coast Guard determined that overloading may have contributed to the casualty. ROXANNE (1995) The 35 foot fiberglass fishing vessel Roxanne caught fire and sank while under tow November 1, 1995 in the Bering Sea near Saint Paul Island. ROYAL FISHER (1972) The crab fishing vessel Royal Fisher was struck by a runaway barge and sunk March 1, 1972 at Dutch Harbor. 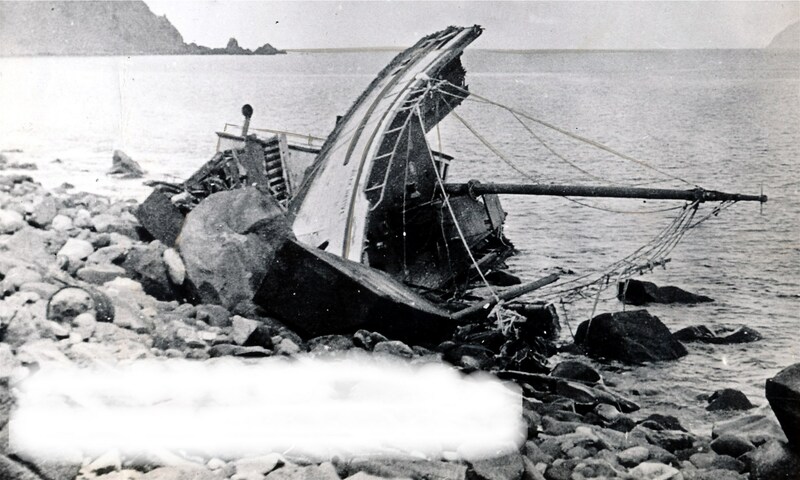 RYOTO MARU NO 2 (1979) The Japanese factory trawler Ryoto Maru No 2 ran up on the rocks in a severe storm and was lost November 8, 1979 in Village Cove near Tolstoi Point on Saint Paul Island. The vessel was later demolished by a U S Naval Explosive Ordinance Detachment and the U S Coast Guard using explosive ordinance and thermal grenades. Cleanup costs were estimated at $1.4 million. There was no loss of life.